Have we missed something important? Let us know by adding your FAQ suggestion (preferably along with an answer) to the pinned FAQ topic in the Final Fantasy I forum. This game is way too hard. How are imps killing me? How do I see a world map? What is with this stupid Mystic Key? I want to open these doors NOW. What is a good place to gain lots of levels early in the game? I heard there was a minigame on the ship. How do I access it? I have the ship, but I have no idea where to go. What's my next destination? I got the Crown, what do I do now? Okay, but what's the Crystal Eye for? ...And the Jolt Tonic? What's that? Okay, woo, I got the Mystic Key. But I forgot where all the locked doors are! The only other place I can go to is Mt. Duergar. What do I do there? What do I do with this Star Ruby? What do I do to the stone slab in the Terra Cavern? Where do I go after defeating Lich? How do I get to Mt. Gulg? I finished Mt. Gulg, now what? I just got the Levistone. What do I do now? Where do I go with the airship? I want to change class! Okay, I've changed my class. What's the plan now? I just beat Kraken. But now, I'm completely stuck. All these stupid robots in the Tower of Mirage are telling me I need a Warp Cube. Where is that? So, where's this Warmech that I've heard so much about? Awesome, I restored all the crystals. Have I finished the game? How do I get out of the Temple of Chaos? There's no teleporter to return! There's another stone slab here, and I don't know how to move it. When the game first starts, go right into town and get weapons and armor! Your characters start with nothing, and without equipment, you're at the mercy of the monsters. To see the world map, push the Start and Circle buttons together. Too bad, you will get the Mystic Key after you wake up the Elf King. It'll come sooner than you think, don't worry! A favorite spot, if you're willing to invest some time and Gil into some battles that you might not survive, is just north of Pravoca. The battles there will put you against enemies that are from the Lufenia area, so the enemies are tough; however, you'll get lots of good EXP for each win. We've created screenshots of the airship view, the ground view, and the world map to help you find it. You can access the minigame by holding down the confirm button and pressing the cancel button 55 times. You win 100 gil just for completing the puzzle, and you are timed. If you get the best time, you win 10,000 gil. You can get this prize over and over as long as you break the best time, so consider waiting until your current time is just slightly better than the record to finish the puzzle so you can win the prize over and over. After you receive the ship, sail south from Cornelia until you reach another coast. From there, look for a port. South of that port is the town of Elfheim, your next destination. Take the Crown to the Western Keep. There, you will fight Astos, who will give you the Crystal Eye. You have to take the Crystal Eye to Matoya's Cave. Then, you'll receive a Jolt Tonic. Finally, you will be able to wake up the King of Elfheim with the Jolt Tonic. After that, you'll receive the Mystic Key! You can find doors locked with the Mystic Key in Cornelia Castle, the Temple of Chaos, the Elven Castle, the Western Keep, the Marsh Cave, and Mt. Duergar. First, you need to bring the Nitro Powder to one of the dwarves from Cornelia Castle. Then, you can create a canal on the world map that allows you to get to Melmond. The Star Ruby is a favorite food of the Titan in the Titan's Cave west of the Terra Cavern. Give it to him, and you can go through to get the Earth Rod from the Sage. You need the Earth Rod from the Sage, first. Then, in front of the slab, select the Earth Rod from your menu and the stone slab will disappear. You'll need to travel to Crescent Lake. From Melmond, travel back to the canal, but NOT through it. Then, head south, following the coast. Go east as it turns that way, and you'll pass a port near Elfheim. 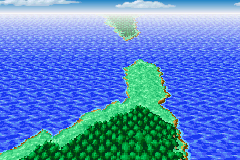 Continue on, and you'll find another port as the continent curves northward. Park your boat there, and head west to Crescent Lake. In Crescent Lake, you'll need to find a path to the twelve sages, who will give you a Canoe. Take this to the shallow water outside the town, and follow the rivers until you find Mt. Gulg. If necessary, check the world map for the correct river paths to take. After defeating Marilith, you'll need to return to your boat. Take the boat northward and you'll quickly reach another port. 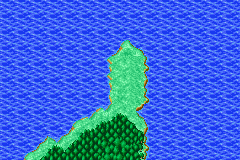 From this port, follow more rivers until you reach the Ice Cavern. There is a desert south of Crescent Lake. As soon as you step on any patch of desert, go into your menu and select the Levistone. You will then receive the airship. Look for a town surrounded by mountains. This is Gaia. 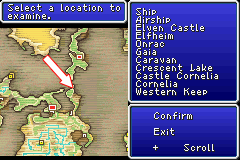 After you have the airship, search around west of Gaia for a dilapidated castle. This is the Citadel of Trials. Long story short, you'll find a Rat Tail inside, and you need to take it to Bahamut, who lives in one of the many caves on a series of islands southwest of the Citadel of Trials. Now, you need the Bottled Faerie from the Desert Caravan in the desert east of Gaia. Once you've got that, go to Gaia, release it at the spring, and you'll receive the Oxyale. Take this to Onlak and you'll be in the next dungeon. You got the Rosetta Stone from the Sunken Shrine, right? If not, return there and search around for it. When you have it, take it to the researcher in Melmond, and you'll learn the language of Lufenia, a town far south of Gaia. Head back to Onlak, and take the canoe north of town along that river you see there. You'll reach a waterfall. Sail right into it, and you'll enter a cavern where you can find the Warp Cube. You can encounter Warmech on the long path right before the Wind Crystal in the Flying Fortress. The chance to encounter it is very low, so you may be there for awhile. Nope, unfortunately, you haven't. You have one more dungeon to go. Head back to the Temple of Chaos where you fought Garland, and enter his chambers. If you approach the podium, you will activate it with the crystals and you will go back in time. I hope you have Warp2, because that's your only hope. Use the Lute that you (hopefully) received from Cornelia's Princess after rescuing her.